America’s first Independence Day of World War II was idyllic at Harvard University. On campus tennis courts nestled between the college soccer field’s verdant green and the golden dome of the Business School library, players in whites gathered for morning games. 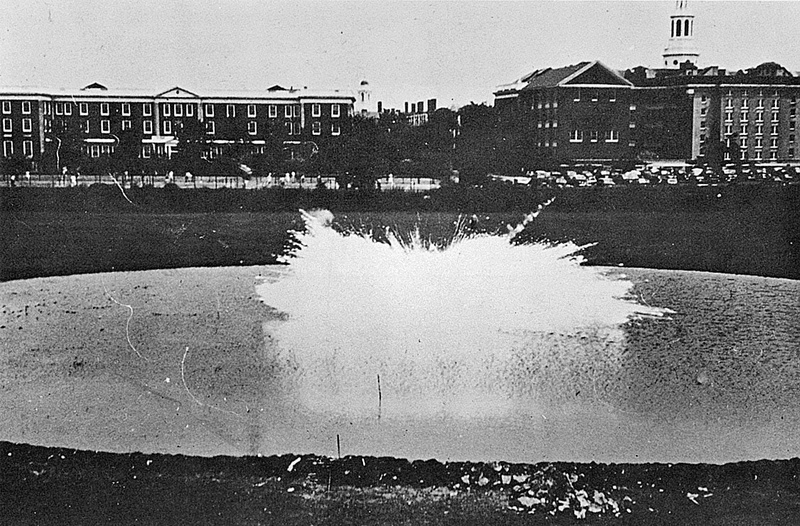 They volleyed as university maintenance workers armed with shovels arrived, cut into the field, and built a circular parapet a foot tall and 60 yards in diameter. Fire trucks from the City of Cambridge rumbled up, and men flooded the circle to make a wide pool four to nine inches deep. By mid morning, all was ready for the arrival of Sheldon Emery professor of organic chemistry Louis Fieser, one of the university’s most brilliant scholars and head of “Anonymous Research Project No. 4,” a top secret war research collaboration between the school and the government. Fieser arrived. He was 43 years old, tall, bald, with traces of the Williams College varsity football lineman he once was still present in his bearing. An octet of assistants followed. He equipped four of the young men with boots, buckets, long sticks, and gloves, and positioned them around the pool. With assistance from the others, he gingerly lugged a live 70-pound napalm bomb, bolted nose down on a metal stand, to the center of the lagoon. A wire ran to a control box on dry ground. Firemen and groundskeepers looked on. Players 50 feet away traded forehands. Professor Fieser’s firestorm was over in seconds. Hunks of gel hissed, flickered, and died. A pungent aroma of phosphorus, like garlic or burning matches, mixed with the oily smell of gasoline, hung in the air over the flooded field and empty tennis courts. Napalm bombs had arrived in the world.